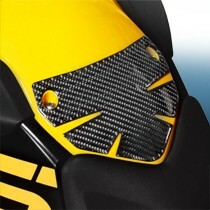 All ZTechnik® Genuine Carbon Fiber accessories are designed on each individual motorcycle model. This guarantees a perfect and precise fit with contours and edges that compliment the design of the motorcycle's bodywork. ZTechnik Genuine Carbon Fiber accessories are made to stand up to years of use. They will not delaminate like cheaper imitations, nor will they fade and bleach out like faux carbon fiber material. They're made to the highest quality standards – our own. Discontinued Carbon Fiber Kits, Gauge Trim and Rear Rack Trim pieces may be available. Please call or e-mail ZTechnik for availability. ZTechnik® Genuine Carbon Fiber Trim not only looks great on your bike, but it also helps protect your bike's finish from jacket zippers, fuel cap keys, and any luggage carried on the rear rack. Trim options available as individual pieces are Tank Protectors, Fuel Cap Trim, and Luggage Rack Trim. Engine Trim Sets and Multi-Piece Trim Sets are available for certain models. ZTechnik Carbon Fiber Trim lets you transform the look of your bike in one easy step! Like all other ZTechnik Accessories for BMW® Motorcycles, they're made to the highest quality standards – our own. High quality, genuine woven carbon fiber material is first cut to shape with a precision die. Next, a clear resin is carefully applied so that the entire perimeter has a smooth, radiused edge, producing a fluid transition to the contact surface of the motorcycle at all points. 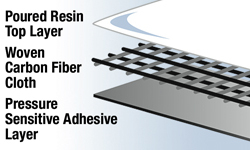 A pressure sensitive adhesive backing is applied that securely, but safely, attaches the carbon fiber piece to the motorcycle.